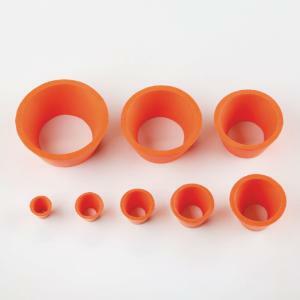 Rubberized filter adapters are designed to seal and protect your glassware. These adapters will provide an air tight seal when filtering with filter flasks. They're ideal for supporting Buchner funnels and protecting glassware when filtering. They can be nested to create the perfect fit and for easy storage. Each adapter has a number molded on the top surface for easy reference. One set includes eight adapters. Ordering information: This set includes eight adapters. Adapter #1 measurements are height: 19 mm, top inner diameter: 16 mm, bottom inner diameter: 8 mm, and thickness: 2.43 mm. Adapter #2 measurements are height: 20 mm, top inner diameter: 22 mm bottom inner diameter: 11 mm, and thickness: 3.06 mm. Adapter #3 measurements are height: 24 mm, top inner diameter: 28 mm, bottom inner diameter: 16 mm, and thickness: 3.34 mm. 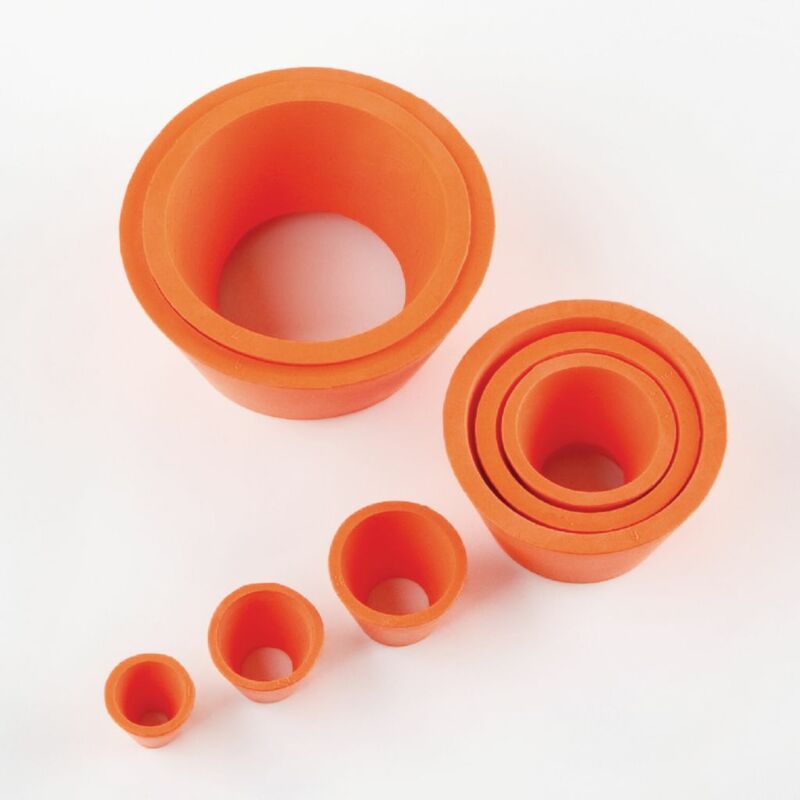 Adapter #4 measurements are height: 28 mm, top inner diameter: 34 mm, bottom inner diameter: 20 mm, and thickness: 4.00 mm. Adapter #5 measurements are height: 34 mm, top inner diameter: 44 mm, bottom inner diameter: 25 mm, and thickness: 4.82 mm. Adapter # 6 measurements are height: 35 mm, top inner diameter: 57 mm, bottom inner diameter: 39 mm, and thickness: 5.30 mm. Adapter #7 measurements are height: 37 mm, top inner diameter: 68 mm, bottom inner diameter: 47 mm, and thickness: 5.63 mm. Adapter #8 measurements are height: 40 mm, top inner diameter: 80 mm, bottom inner diameter: 55 mm, and thickness: 6.00 mm. Measurements are approximate. Packaging: One set has eight adapters.